Boulder City will be sending five athletes to the track and field state meet Friday and Saturday at Carson High School in Reno, Nevada, highlighted by a pair of boys participates and a trio of Lady Eagles. 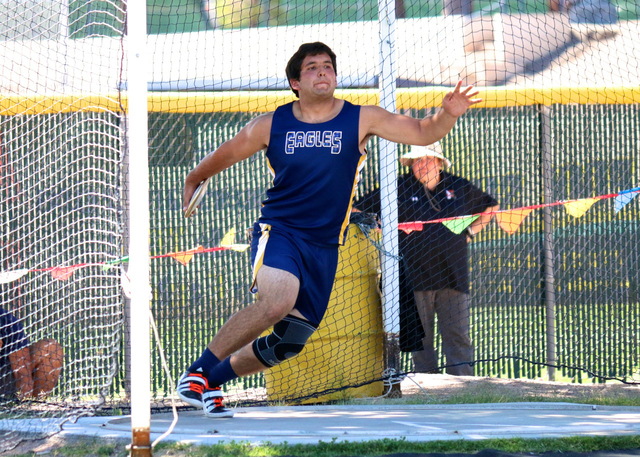 Returning to defend his Division I-A state champion, Boulder City’s school record holder in the discus event, senior Sam Gomez, will compete in the shot put and discus events following first-place finishes in both event at the Division I-A Southern regional meet held Friday and Saturday at Boulder City High School. Also representing the boys will be senior pole vaulter Troy Wilborn, who placed third at regionals with a leap of 11-6. For the Lady Eagles, junior Kenadee Bailey will compete in the triple jump, following a fourth-place finish at the Southern regional meet with a leap of 33-2, while seniors Jordyn Trobiani and Bayden Huxford will compete in the 400-meter dash and pole vault events. Trobiani finished fourth in her event with a time of 1:01.42, while Huxford finished third with a leap of 7-6. Sophomore distance runner Sierra Selinger had qualified for state in the 3200-meter run with a time of 12:35.85 but will be unable to make the trip because of an injury. While competing in the 800-meter run, Selinger broke her metatarsal and later proceeded to run the 3200, qualifying on a broken foot. The Boulder City High School boys golf program finished the first round of the Division I-A state meet in fifth place on Tuesday at the Mountain Falls Golf Club in Pahrump, placing as the third-highest program from Southern Nevada through 18 holes. Finishing with an overall team score 449, the Eagles trail only first-place finisher Faith Lutheran (389) and second-place finishers Pahrump Valley (411) among Southern Nevada programs. Northern Nevada programs Elko (434) and Spring Creek (442), are currently slotted third and fourth, respectively. Finishing tied for seventh place after the first round, junior Kyler Atkinson shot an 81 on the par-72 course and is only five strokes off the second-place lead. Faith Lutheran golfer Charlie Magruder held the overall lead with a score of 67. Looming closely behind Atkinson, junior Samu Jancuk shot an 83 during round one to finish tied for ninth with seven other competitors after 18 holes, while sophomore Jackson Wright finished tied for 11th with a score of 85. Complete coverage of the Division I-A golf state meet will appear in next week’s issue.